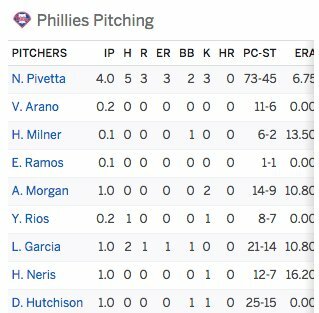 The #Phillies used 21 pitchers to pitch 28 innings in three games. Pedro Florimon was one of them. So this guy’s getting fired, isn’t he? What is your take on Kapler? i think they might have been limiting his innings, since he got a late start? time to "put down" the Phanatic? The Phillies optioned starter Zach Eflin following his start on Friday night and activated infielder J.P. Crawford from the disabled list. The way the Phillies schedule is structured, Eflin won't miss a start. Instead, he'll be recalled to take part in a doubleheader as the 26th man before returning to the minors to complete the mandatory 10-day assignment. In the interim, the Phillies will benefit from having a five-man bench from which to pull from during late-and-close spots. "While this transaction on the surface seems purely administrative, it caught us by surprise and is tremendously disappointing. Major-league starters have a strict routine that they adhere to that allows them to be successful; this roster move affects that. While the club may feel that they are doing what's best for the organization, they also lose sight of the human element and how it will affect the player." Really can't wait for the next CBA negotiations. btw i will be attending a Baseball Prospectus event before the game this Saturday that will include a session with assorted Phillies personnel, including analytics ppl. Gabe is in though! Do you have any questions? Surprise guest confirmed: Phillies manager Gabe Kapler will be joining us for Saturday's event at Citizens Bank Park! Was down to see the Phillies yesterday. Hope they make the playoffs--good young lineup, six or seven guys around 25. I notice they've been outscored by a run this year, so they've obviously been a little lucky.